The summer temperatures aren't slowing down our Team Brandon Valley athletes! Over the past two weeks our players brought the heat to competition at Augustana University and the Sanford Pentagon. We're excited to lift up these "hot" players for all their accomplishments and hard work. The Team Brandon Valley 6th grade girls earned second place medals at the Augustana University tournament. Evie Hoff, 5th grade: Coach Terveer is pleased to recognize Evie for her work at the Augustana tournament - but also for her outstanding effort at practice all week! Whether in the game, or practice, Evie does her best. Her defensive stand makes it hard for a player to score off of her. She dives on the floor and saves the ball from going out of bounds. On the offensive end, she is a leader and helps her teammates when they need it. Evie is the first one off the bench to encourage her teammates - making her an exceptional teammate. Evie tells us she wants to be a veterinarian when she grows up. Her favorite thing about playing basketball is getting better and having fun with her friends. Evie's favorite BV athletes are Caden Deckert and Trinity Law. Paisley Hoff, 6th grade: Paisley did a great job throughout the entire tournament last weekend at Augustana. Coach Klumper said she showed tremendous effort and hustle. Time and time again, Paisley hit the boards with reckless abandon, both on offense and defense. Many of those offensive rebounds were turned into put-back layups. As a defender, Paisley showed a lot of grit and toughness, flying around the court to trap or stop the ball. On offense, Paisley did a great job of being aggressive with the ball, going strong to the basket. She also knocked down some really nice jump shots. Paisley tells us her favorite subject in school is science and she wants to be an endocrinologist when she grows up. Her favorite BV athlete is Caden Deckert. 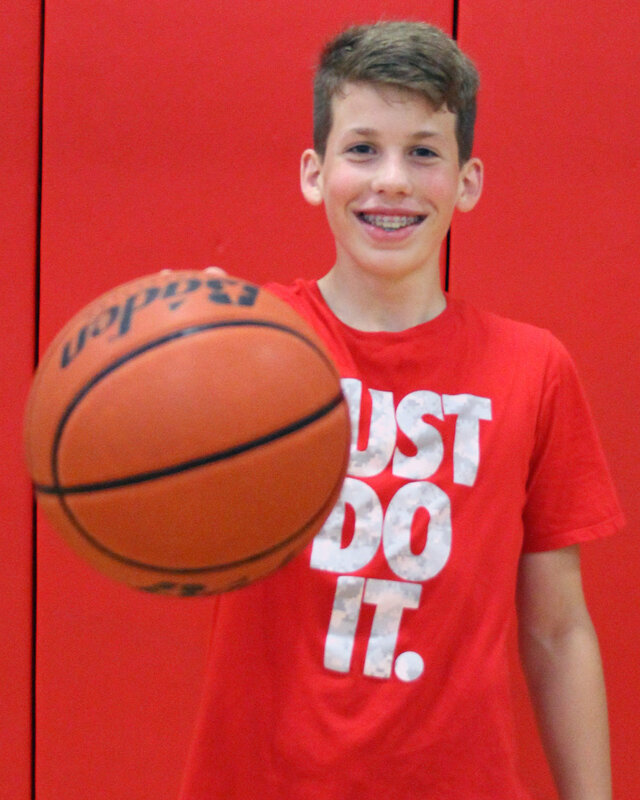 Isaac Jarvoski, 6th grade: This weekend, Isaac led his team on both the offensive and defensive sides of the floor. Coach Waltner said that when his team needed a spark, Isaac stepped up and made key plays. His coach was especially impressed with the amount of effect Isaac put into every single play. Isaac tells us his favorite subject in school is math and he plans to be a teacher when he grows up. Isaac's favorite basketball accomplishment is scoring ten points in one minute! He tells us his favorite BV athlete is Carter Olthoff. Austin Brummels, 6th grade: Coach Meyer said Austin was fearless in each game he played. He was the first one up and down the court, getting to the rim and taking the big shots. Austin showed resiliency and coachability in each game. Austin tells us his favorite subject in school is math and he plans to be a doctor when he grows up. His favorite thing about playing basketball is taking on tough competition. Austin's favorite BV athlete is Alex Waltner. Nathan VanDeBerg, 7th grade: Coach Jurgens said Nate did a great job this weekend with especially on rebounding. No one could match his effect on the boards. He also helped his team with some key jump shots on the offensive side of the court. Nate tells us he wants to be an engineer when he grows up. His favorite thing about playing basketball is dunking and his most memorable accomplishment was making a buzzer beater shot in 6th grade. Nate's favorite BV athlete is Dale Moss. Brady Koupal, 8th grade: Brady played with excellent energy on the floor all weekend, which was infectious to his teammates. He was always communicating with teammates and was an extremely coachable athlete all weekend. Coach Scholten said Brady played with confidence on both ends of the floor, allowing him to score many points and grab multiple rebounds. Brady tells us his favorite subject in school is history. He thrives on the competition of playing basketball and lists a game tying shot as his most memorable achievement to date. Brady's favorite BV athlete is Drew Jurgens. Christian Jepperson, 8th grade: Christian showed a lot of toughness in the post last weekend, particularly while he was on defense. Coach Schultz said he forced good players into taking tough shots and did a great job of rebounding with a lot of contact from the opposing players. Christian tells us his favorite subject in school is science and he wants to be a doctor when he grows up. His most memorable basketball achievement is beating Memorial Middle School. His favorite BV athlete is Carter Olthoff. Mason Rolfson, 9th grade: Coach Deckert said when Mason puts his mind toward defending he's a handful for any ball handing guard. This weekend he stood out for his hard work and the extra possessions he got our team through pressure defense and offensive rebounding. Mason tells us his favorite subject in school is science. His most memorable basketball achievement is going undefeated during his freshman year. Mason's favorite Brandon Valley athlete is Dale Moss.